This week, I had the great pleasure of attending Keller Williams National Convention, better known as Family Reunion, with over 15,000 other Keller Williams agents from across the world! Gary Keller, founder of Keller Williams, is truly a real estate guru. His annual vision speech is always inspiring, informative, and sometimes even worrisome! Well, the market is fabulous. We’ve got low interest rates, steady appreciation, lowest unemployment rates since 1999, and home affordability at historic lows. So, why do I say worrisome? Honestly, I’m concerned about one sector of the population… The recent college graduates. 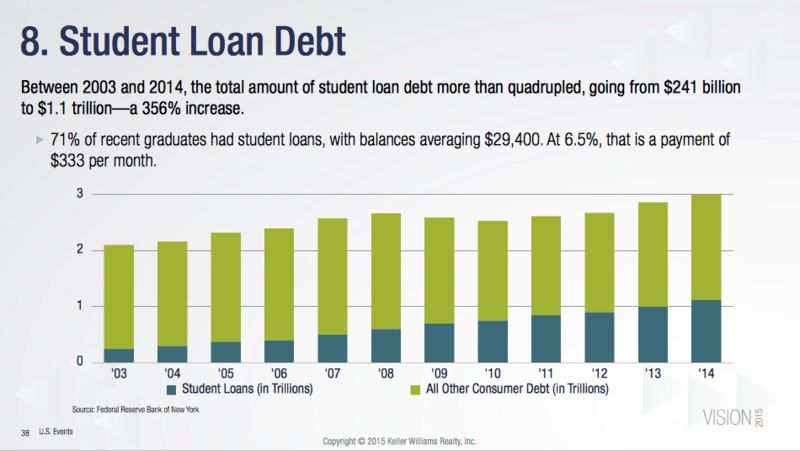 Did you know that there has been a 356% increase in student loan debt in the last decade? That is astounding. The average student debt is $333/month. That takes away about 8% of their monthly income. When we see interest rates go up, those young college grads with student loan debt aren’t going to be able to afford a home. And, this could slow housing growth. In fact, there is now a 4-5 year lag between the time these young professionals even start thinking about buying a home after college! In 2014, first home homebuyers made up 33% of home sales with the historical average being 40%. When I started in real estate, I was 26 years old and first-time homebuyers were my bread and butter! They were able to move to Atlanta and buy condos, townhomes, and cute little starter homes all over the city! Best of all, they started building their wealth! I don’t want these young college graduates to have a 4-5 year lag before home ownership. So, Atlanta first time home buyers… Here’s what you can do… Call us today! Call us before interest rates go up and home affordability goes down. Take advantage of FHA 3.5% down financing. You can start building your wealth today and in many cases for less than you pay in rent! The Peters Company loves working with Atlanta’s first time homebuyers and we’d be honored to turn your home ownership dreams into a reality. Call us at 404-419-3619! ← Just Listed :: Wonderful Townhome in Ashford Creek!